Differences over how to reconfigure the auto industry have slowed progress on retooling the North American Free Trade Agreement, with Mexico showing some flexibility but refusing to completely meet U.S. demands. MEXICO CITY/WASHINGTON — Mexican President Enrique Pena Nieto late on Thursday expressed optimism about NAFTA talks that have been thrown into disarray by a U.S. probe exploring auto tariffs, while a source said Mexico had made a new offer to seek a deal. The Mexican leader said he spoke with his Canadian counterpart Justin Trudeau late Thursday about reworking the 24-year-old pact that underpins Mexico’s economy, and that the trade partners would keep close communication. “He remains optimistic about achieving a revised free trade agreement that benefits the three countries,” said a statement from Pena Nieto’s office. On Wednesday, U.S. President Donald Trump’s administration said it would examine whether car and truck imports from around the world harm its auto industry, a move that may lead to new tariffs on exports to the world’s second-largest auto market. One Trump official said the investigation was partly aimed at yielding NAFTA concessions from trade partners Mexico and Canada. Pena Nieto’s spokesman on Thursday had said Mexico would not buckle to pressure to conclude the long-stalled renegotiation. “Mexico is not going to negotiate on the basis of pressure, Mexico is very clear about what works and what doesn’t work for us,” said Pena Nieto’s spokesman, Eduardo Sanchez. “If an agreement is reached, it will be one that truly benefits Mexico. If these conditions don’t exist, Mexico will not move forward,” he added. Canadian Prime Minister Trudeau on Thursday also said Washington was using the auto tariff probe as a negotiating tool. However, Mexico made a new offer on autos “showing some flexibility” on Thursday, following the U.S. announcement of the national security probe into car imports, a person familiar with the talks said. It was not immediately clear if the offer encompassed other areas under negotiation. The three sides are in constant contact, including phone calls between ministers, and further talks were likely over the weekend, the person said. Mexico has in recent days responded to U.S. proposals with an offer that 20 per cent of any auto made in North America would be produced in high-wage areas, a Mexican industry source briefed on the talks said. It was not immediately clear in what areas Mexico had shown further flexibility on Thursday. The United States wants 40 per cent of auto content to come from areas paying at least $16 hour. 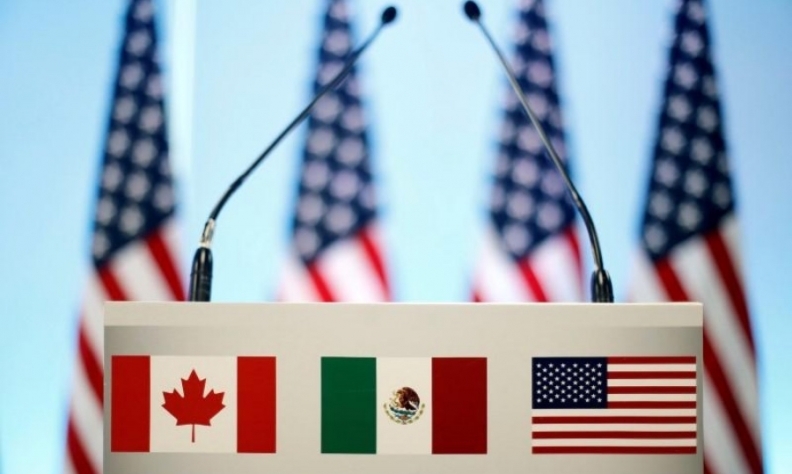 Mexico has also proposed that 70 per cent of overall content of a vehicle made in North America come from the region, countering a U.S. proposal of 75 per cent for high-value parts. Mexico and Canada have long demanded that the United States drop some of its most contentious ideas, including a so-called “sunset clause” to make NAFTA automatically expire if it is not renegotiated every five years. Mexico’s economy ministry did not respond to a request for comment. Chief trade negotiator Kenneth Smith took to Twitter on Thursday to defend NAFTA’s role in expanding the U.S. auto sector, saying U.S. output grew 124 per cent since 2009. Trump ordered the renegotiation of NAFTA to meet a campaign promise to bring more manufacturing jobs to the United States. The nine-month long talks are now bogged down by differences over auto production. Once again courting voters in the U.S. industrial heartland, this time ahead of mid-term elections later this year, Trump says NAFTA has killed U.S. jobs and has threatened to scrap the deal. Japan’s foreign minister, Taro Kono, told reporters in Mexico City on Thursday that his Mexican counterpart, Luis Videgaray, had promised to protect the interests of Japanese firms in NAFTA talks. “He repeated that he would protect the interests of Japanese companies, for which we are very grateful,” Kono said. Major Japanese auto makers including Toyota Motor Corp and Nissan Motor Co Ltd have sizeable operations in Mexico.